I’ve been trying to run faster the past week. 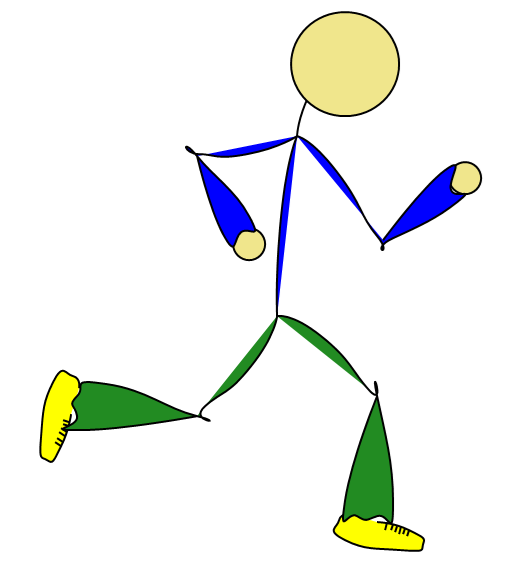 When I had a personal trainer in St. Louis, she told me: “If you want to run faster, you have to run faster.” As there often is, there’s complexity in tautology. For a while, I got a little faster just by going out and running at the same effort level. Because I was getting into shape, and I could just sort of improve, without a huge amount of effort being put into speed. Don’t get me wrong, there was a huge amount of effort just put in to moving. But I wasn’t trying to go fast. And I didn’t really think I wanted to go fast. I had a basic goal of running 10K in under an hour, which requires about 9:40 miles. That’s a good clip, but it isn’t anything too impressive. But it’s a reasonably fast jogging speed for a late 30s dude, which is what I was at the time. And I did that. Last year, in the spring of 2013, I ran ten kilometers in about 59:30, and I was happy, and it felt like a big accomplishment. Then I stopped trying to run any faster, and started trying to run further. I got slower, but that was ok. Because I was running 10, 11, 13 miles at a time, and that was a major accomplishment of its own. Now, having run two half-marathons with BB, I am torn between two goals. I want to get faster, because faster is fitter and my main goal in all of this is to not get diabetes. For that, I need to stay trim, and I need to have good cardiovascular fitness. But I also am finding myself more and more pulled in by the ambition of completing a full marathon. At least once. I think. But I’m also compelled by the idea of, say, finishing a half marathon in under two hours, which is a wildly ambitious goal for me. That requires running 13.1 miles in a row faster than 9:10 min/mile. That seems almost impossible. Or at least it did, until yesterday. Yesterday, I ran 10K (6.21 miles) in 55:22. That’s 8:52 min/mile. Which is crazy fast, for me. Tuesday, I ran 5K (3.11 miles) in 25:57, or about 8:18 min/mile. Which is blazing speed for me. Like, beyond what I thought was possible. But if you want to run faster, you have to run faster. I had to increase my effort level, be prepared to fail, and run like hell. And I did. And I didn’t fail. And maybe, that 2 hour half-marathon is a possibility. Maybe that full marathon is on the horizon. My friend @scicurious tells me that running faster will help me run further too. If for no other reason than that I can go a further distance in the same amount of time. And then, BB and I can run together, faster, further. And maybe I can stave off the specter of metabolic infirmity until I’m old and tired. I feel good. I’m doing things I didn’t know I could do. Things I didn’t know I wanted to try. But now I’m here. This is kind of amazing to me. And I’m happy. I’m going to get the image below inked on my right calf. Run like hell. You are smoking it. Good for you.